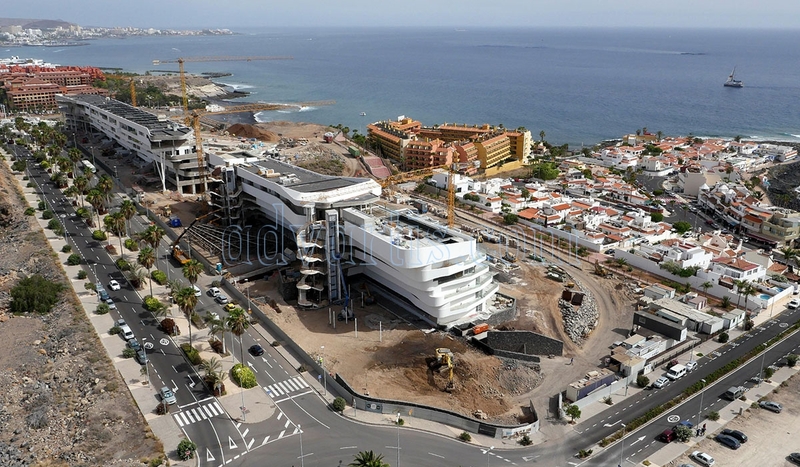 It’s numbers overwhelm: 140 million investment, 300 workers, 603 rooms distributed in two buildings, 25 villas, 55 private pools in the rooms, six restaurants … It is the letter of introduction of the first luxury hotel in La Caleta (Adeje, Tenerife south) which will open its doors on December 15, 2017. 250 workers are deployed every day by the installations of this colossus, with an imposing aspect of cruising of rectilinear forms, combined with elements that break the continuity of the symmetry, in the countdown for the arrival of the first clients. The capital comes from Belgian investors (the same ones who built another emblematic establishment in the area, the Baobab) and the exploitation will be carried out by Mallorcan chain Barceló. The Royal Hideaway (royal getaway) Corales Resort, spread over a 400 meter front, has many singularities that make it an establishment called to mark a before and after in the concept of great comfort. To begin with, it promotes a novelty in the Canary Islands, which is to offer two independent buildings, linked by a bridge, destined for family and adult tourism. In both cases the rooms and services have been designed according to the profile of both customer segments, taking care of the smallest detail. Thus, the family module will have up to three rooms, large terraces and pools of 8.5 meters long included in them – up to 55, while the adults only sector, for clients over 16 years, will have other services more own For rest, such as spa areas and more areas of gastronomy. Another peculiarity lies in a great commitment to interior design (the example of private pools is the most obvious) so that guests enjoy more of their room, at least as much as the common areas. Hence the spaciousness of the rooms and their complete equipment, with kitchen, jacuzzi, showers on the terraces, large televisions, etc. “We want the customer to enjoy the luxury in his own room and that this is not a space where he goes to sleep, leave the suitcases and run to the pool. 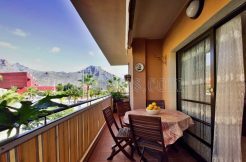 We give them the maximum comforts so that you can make life in your room; Is a new concept in Tenerife “, explains the architect of the project, the architect from Tenerife Leonardo Omar, one of the most sought-after professionals on the island, which is sponsored by large foreign investors. “Luxury is space, both surface and quality, with flexible distributions, open and with views. That is why we try to look for the open space with a clear vision of the landscape, the sea, of La Gomera, “says Omar, who summarizes his philosophy with a phrase:” The building is not more important than what you see from it. ” At the Royal Hideaway Corals Resort, which will be five stories high, even details that may seem minor are a priority. In fact, everything is a priority. Serve as an example that only three million euros will be invested in landscaping: 1.5 in the forest that will be planted towards the summit, and the same amount in the green area that will be created in front of the sea, where you will “bring the landscape from the ravine to the hotel “, creating a malpais with tabaibas, cactus and other wild species. Among the architectural details of the structure, Leonardo Omar emphasizes the 20 meters of flight that exist between the last pillar and the tip farthest from one of the main decks. “It is a structural allegory; The easiest thing would have been to put a pillar like in football stadiums, “he explains. 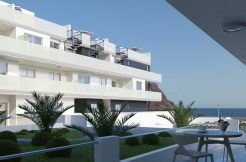 The front of the hotel will have two lines of villas (25 in total) with private pools. Among them, the honey moon, for couples who enjoy their honeymoon, whose constructions will have a special orientation towards the sunset. In addition to three large swimming pools, two receptions, an entrance hall carved in natural rock, six themed restaurants (among them the Atlantic, with gastronomy of the Islands), spa, gym, shopping arcade and great luxury jewelry, the icing on the cake Will be on the top floor, with an imperial suite of more than 600 square meters (the size of seven floors with standard measure) next to the spectacular bridge, which will join the two buildings and whose structure will be assembled next week. Exclusive service of kitchen, barbecue, swimming pool, jacuzzi, a huge terrace with sea and mountain views, exclusive brand furniture and even a sofa valued at 25,000 euros are part of the amenities offered by the most select space in the entire hotel. Top clients, predictably movie stars, music and sports. Its price? Between 7,000 and 8,000 euros a night. The two buildings and villas that make up the luxury complex, which will work 300 people, will have an immature system, an intelligent method to control temperatures and consumption of water, electricity and air conditioners, which, together with The installation of solar panels to produce hot water throughout the building and the generation, through an exchanger, of heat and cold for the air conditioners, will make it a low energy hotel. In addition, the rooms are provided with a system so that when the windows are opened, the air conditioning is switched off to avoid unnecessary energy expenditure. The Royal Hideaway Corales Beach – Adults Only 5 star GL hotel combines the exclusivity of a luxury hotel with modern facilities and a unique architectural design inspired by the interesting shapes of the coral reef. Located in the south of the island of Tenerife, in Costa Adeje, this hotel is the ideal way to enjoy a relaxing holiday in one of the most beautiful corners of the world. On the seafront, it is just 50 metres from Playa de La Enramada. This outstanding hotel, which forms part of the Royal Hideaway Corales Resort, has 121 elegant rooms exclusively for adults (age 16+). All the rooms have stunning views of the ocean, along with the most exclusive facilities and services expected of a spectacular luxury resort. Some are equipped with a hot tub to put the cherry on top of an unforgettable holiday. Its innovative concept, inspired by the natural surroundings, turns your stay into a delight for the senses, not only because of its original architecture, but also thanks to its refined restaurants and its Wellness Centre. In addition, the hotel has a tropical garden with swimming pools for cooling off and enjoying the outstanding year-round temperatures of the Canary Islands. The Royal Hideaway Corales Beach – Adults Only hotel is so much more than a 5-star luxury hotel – it is modern and innovate, and shows immense respect and admiration for the environment. All of this comes together in perfect harmony, providing allure to even the most discerning guests. The architect Leonardo Omar, 42 years old, is, today, one of the most valued professionals in the southern region and on the island of Tenerife. Its commitment to the integration of its constructions in the landscape through rectilinear forms covered with white in which the functionality premium has turned it into a reference with international projection. The Baobab hotel in Costa Adeje, the Caleta Palms apartment complex in La Caleta, 44 villas in the El Duque shopping center and several luxury buildings in the Abama hotel in Guia de Isora are some of his most significant.